Automatic transfer switches (ATS) on ATO.com have a wide range of selections with ratings from 6 amps to 800 amps. ATS transfer switch is a device to changeover between the utility and standby power source when one power fails. ATO offers three kinds of auto transfer switches with their own characteristics and functions, which make it applied to different areas. The switches here can be operated both automatically and manually. Go into a detailed product page and find a suitable auto transfer switch to changeover the source in case of power failure, so as to guarantee the continuous and reliable operation of the critical equipment. 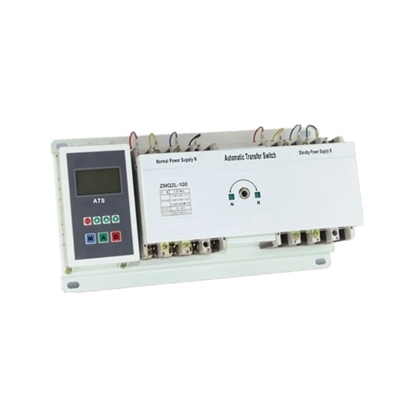 Low price dual-power Automatic Transfer Switch with high-breaking mini circuit breaker, selectable 3-pole or 4-pole, is available for rated operating current 6A, 10A, 16A, 20A, 25A, 32A, 40A, 63A, with three positions of normal power ON, dual OFF, standby power ON. Simple structure, easy operation and long service life.